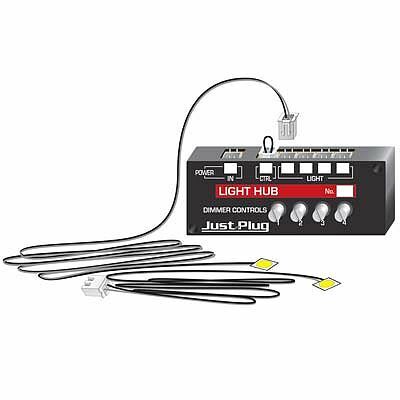 This is the Lights and Hub Set from the Just Plug Series by Woodland Scenics. Retail $19.99 SAVE 24% ! This is a great item. I love how easy it is to light up buildings. Get this hub, and you can light up two. The bad part is, the lines are only 24 long. The good news is, they make 48 long extensions. And you can dim or brighten the light the shade you want. Of course, if you have more items to light up, you get their extension hub. And can hookup an ON/OFF switch to it as well. Each building would require one of the 4 ports. However, if you purchase street lights, they are 3 street lights connected together, to use one port. Before purchase, go to YOU TUBE and search on JUST PLUG, and watch the ones produced by Woodland Scenics. Quickest and easiest way to add lights to any project. Two warm white LED stick-on lights. Use the individual dimmer controls to regulate light brightness. Add an optional auxiliary switch for convenient operation. Need one Just Plug Power Supply (WOOU5770) to power up to 50 light on your light system, or if you want to power your syste from a train power pack, purchase Connecting Cables (WOOU5760). Compatible with DCC and works for any scale. This is a great easy to use system. No soldering needed. Just plug it in and you are all set. The only sad thing is to power it, you either need a set of connecting cables to connect it to your transformer or the AC Adapter to plug it into the wall. My set is over 15 years old and most of the wiring is done, but if I were starting all over again, I would only use the system for my building lights! It&apos;s really well thought out.